Thomas Melle, born in 1975, studied Comparative Literature and Philosophy in Tübingen, Austin (Texas), and Berlin. He is the author of frequently performed plays and has translated works by authors such as William T. Vollmann and Tom McCarthy into German. His collection of short stories entitled “Raumforderung” (2007) received the “Förderpreis” for emerging talent, which is awarded alongside the Bremen Literature Prize (“Bremer Literaturpreis”). His debut novel “Sickster” (2011) was nominated for the German Book Prize and was recognized with the Franz Hessel Prize. The novel “3000 Euros” followed in 2014. It was shortlisted for the German Book Prize and earned Melle the Berlin Art Prize (“Berliner Kunstpreis”) in 2015. 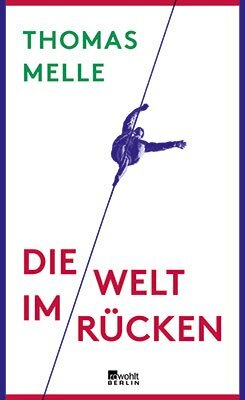 “Die Welt im Rücken (The World at Your Back)” was published in 2016. It also made the short list for the German Book Prize and was recognized with the Klopstock Prize. Melle is the 2017/18 recipient of the “Stadtschreiber von Bergen” (Bergen writer in residence) award. He lives in Berlin and Vienna. Thomas Melle has suffered from manic depression, also known as bipolar disorder, for many years. He tells in blunt, brilliant language about how he has dealt with the illness, about personal dramas, and slow recovery ― thus providing unusual insight into what a person with the illness is experiencing. The captivating chronicle of a disrupted life, an autobiographically radical work of the greatest literary power. The book was shortlisted for the 2016 German Book Prize, delighting the press and readers alike.